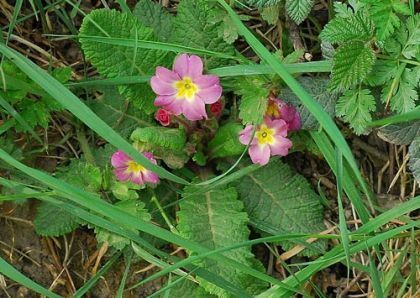 Primrose is not easily confused with other wild plants on this web site. The Latin name translates as 'First flower' and indeed this little plant even shows its head before the end of the old year in sheltered places (see below). Our little 'Sabhaircín' generally flowers from April to May when its pale yellow 2-3cm flowers with their deep yellow centres decorate grassy banks, woodlands and roadsides. Each flower has its own leafless stalk. 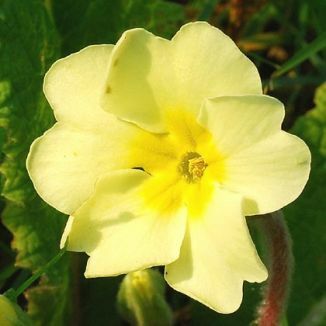 Primrose has quite large, crinkled leaves – up to 12cm long – which taper gradually into the stalk. Like Primula veris, the Primrose has two types of flower on each plant – thrum-eyed and pin-eyed. Thrum-eyed means that the stigma is shorter than the anthers, pin-eyed means the stigma is longer than the anthers and projects like a little pin. This means that cross-fertilisation is far more likely to take place. Visiting insects have the pollen transferred onto different parts of their bodies depending on which type of flower they visit and then they in turn transfer that pollen to the other type of flower. Have a close look the next time you come across one of these plants and all will become clear. This plant is a native and belongs to the family Primulaceae.